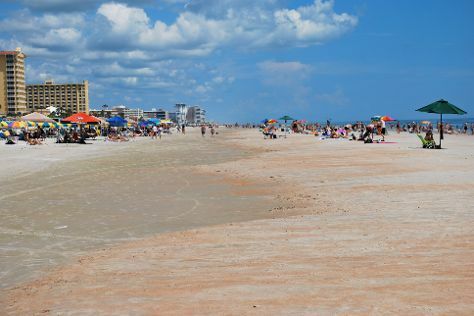 Eschew the tourist crowds and head to Beach at Daytona Beach and World of Disney. You'll visit kid-friendly attractions like Discovery Cove and Walt Disney World Resort. Pack the 10th (Wed) with family-friendly diversions at Universal Orlando Resort. Pack the 9th (Tue) with family-friendly diversions at Universal's Islands of Adventure. Next up on the itinerary: get some fabulous bargains at Orlando Vineland Premium Outlets, get your game on at The Void, and discover the magic at Happily Ever After Fireworks. To find maps, ratings, photos, and tourist information, refer to the Orlando road trip app . Use the Route module to find travel options from your starting location to Orlando. In July in Orlando, expect temperatures between 91°F during the day and 75°F at night. Cap off your sightseeing on the 13th (Sat) early enough to travel to Washington DC. Start off your visit on the 14th (Sun): wander the streets of Capitol Hill, then examine the collection at National Air and Space Museum, then get to know the fascinating history of Tomb of the Unknowns, and finally appreciate the history behind Vietnam Veterans Memorial. Get ready for a full day of sightseeing on the 15th (Mon): take a stroll through Fell's Point and then take a stroll through Annapolis Historic District. For maps, where to stay, more things to do, and more tourist information, read our Washington DC trip itinerary planner. Traveling by flight from Orlando to Washington DC takes 4.5 hours. Alternatively, you can do a combination of flight and train; or drive. In July, plan for daily highs up to 89°F, and evening lows to 73°F. On the 16th (Tue), wrap the sightseeing up by early afternoon so you can travel to New York City. Let the collections at The Metropolitan Museum of Art and Hudson Beach Glass capture your imagination. Head to Fifth Avenue and Country Kettlefor plenty of shopping. You'll find plenty of places to visit near New York City: DM Weil Gallery (in New Paltz), Bushkill Falls (in Bushkill) and Resica Falls (in East Stroudsburg). There's still lots to do: admire the striking features of Empire State Building, take in the pleasant sights at Times Square, hunt for treasures at Chelsea Market, and revel in the low prices at Woodbury Common Premium Outlets. To find reviews, traveler tips, photos, and other tourist information, you can read our New York City day trip planning site . Getting from Washington DC to New York City by flight takes about 3.5 hours. Other options: take a train; or drive. Expect a daytime high around 86°F in July, and nighttime lows around 72°F. Wrap up your sightseeing by early afternoon on the 20th (Sat) to allow time for travel back home.